While Jackson Pollock is considered a characteristically “American” artist, UofSC Art History Professor Dr. Peter Chametzky discusses Mural's significance to international modernist art as it reckons with art's role in the modern world. Free with membership or admission. This exhibition will feature the works created by students in the Spring 2019 School of Visual Art and Design course MART581A: Site-Based and Installation New Media Art, taught by Jennifer Tarr. This advanced new media production class will develop and produce video and new media works specifically for the SVAD Studio at Stormwater Studios. 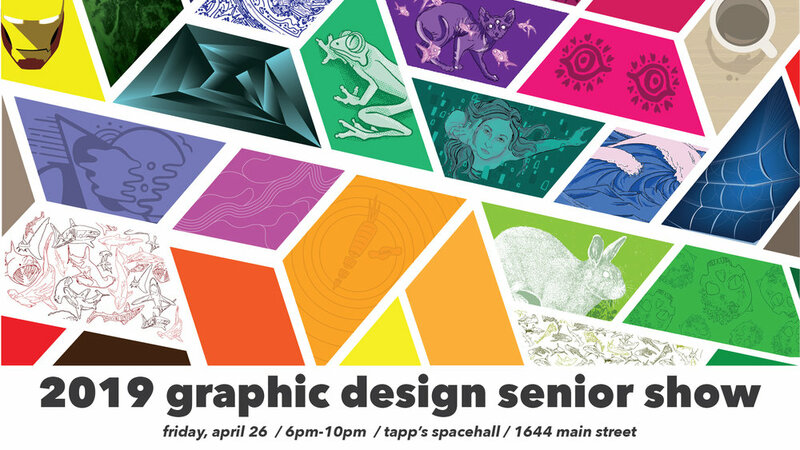 View the works created by SVAD graphic design seniors in this special one-night showcase. The show will be held at Tapp’s Spacehall (inside of Tapp’s Art Center) at 1644 Main Street. For his thesis project, Graphic Design graduate student Noah Valentim created a clothing brand named Thesa. It consists of screen printed, embroidered, and hand sewn pieces that are influenced by anthropology, modern technology, and wellness in a satirical fashion. The featured artists come from different backgrounds and work with a variety of different mediums (including painting, photography, drawing, ceramics, sculpture, and printmaking) but all of their work shares a common relation to the broader themes of environment and time. Each artist brings their own unique insight to the show’s theme of the American landscape. Some of the artists explore the landscape more traditionally, and derive conceptual meaning from a natural sense of place. Tim Adams and Brandon Shull both make nature the subject of their works, in an attempt to reveal universal truths about the natural world and our role within it. Other artists trade the literal landscape for social and temporal ones. Benjamin Campbell and Brennan Booker both use physical location as a springboard for social commentary, highlighting the relationships between places and their social and philosophical atmospheres over time. Join us for the opening reception on May 2nd, from 6pm – 8pm. This exhibition will display the work created by members of Columbia’s community. It will be an outcome of a School of Visual Art and Design graduate Art Education course, ARTE 705/WGST 796: Community Development in Art, which is designed for graduate students to teach art making methods to underserved populations in the local community. See the making of Jackson Pollock’s Mural dramatized as a turning point in the artist's career with a screening of the 2000 film Pollock, starring and directed by Ed Harris. Beforehand, Dr. Susan Felleman, UofSC art history and film and media studies professor, discusses the film's representation of Pollock's life, work, and process through the myths and motifs typical of the modern artist biopic. 122 minutes. Rated R. Cash bar. $5 / free for members of the Museum. SVAD Photography students and faculty invite you to join the opening reception of Entropy: Chaos of Time and Escapism at City Art Gallery in Columbia, SC. This interdisciplinary art exhibition by SVAD Photography students includes photographic prints and interactive works, animated & anamorphic imagery, and fabric objects which together revolve around the unpredictability of time and our tendencies toward escapism. These pieces become visual surrogates for our inner selves and serve as projections of our subjective perceptions of reality. This exhibition includes works by Alyssa Leigh, Chance Eller, Dalton Gantt, Joe Abuelo, Megan Hedrick, Melaney Mottsey, and Rakeem Perry. The School of Visual Art and Design will host an Art+Feminism Wikipedia Edit-a-thon on Saturday, March 30th at the Columbia Museum of Art from 11pm- 5pm. This all-day event is designed to improve coverage of gender, feminism, and the arts on Wikipedia. Chandler Yonkers is an M.A. Candidate in Media Arts at the School of Visual Art and Design. For this thesis exhibition, Vignettes, Chandler invites the public to view an installation that revolves around nostalgic connections to home video. In this project, the content of various VHS cassette tapes and the environments in which those forms of media are produced and viewed will be recreated for a unique viewer experience. Each installation plays a separate home video tape belonging to the artist, but re-contextualized to touch on a variety of subjects ranging from mental illness to power dynamics within the familial sphere. The tapes are heavily edited but presented in a way that suggests they were discovered that way, just as we have all typically stumbled across old VHS videos in our homes. Our annual juried student exhibition with work by undergraduate and graduate students at SVAD. This year’s juror is Eileen Blyth! The official Salon des Refusés, or the “exhibition of rejects,” at the School of Visual Art and Design. How do you balance a full time job with art-making, when being an artist isn't your day job? Join to hear Anna Redwine, Director of Communications at the University of South Carolina Honors College and SVAD alumna, explain how she balances her art-making with a 9-to-5 job. Recognized as one of 50 Most Influential People of 2018 by Columbia Business Monthly magazine, Lee Snelgrove will teach you how to learn from successful artists to jumpstart your art projects post-graduation. We will explore ways to work with non-profit organizations on art projects and discuss how to be funded by a city's public art budget. Join us for our Workshop + Seminar Series! We've curated a series of presentations to help you plan for success post-graduation. Join Allison Moore for a session on game-planning your career. Allison will discuss career paths for those just finishing college and explore options including both graduate school and non-academic possibilities for all SVAD majors and minors. This series is supported by a grant through the John S. and James L. Knight and Central Carolina Community Foundations. Dr. Banks is Associate Professor in the Department of Visual and Media Arts at Emerson College. Her primary area of research is the American film and television industries. Her work focuses on creative and craft guilds and unions, with a specific focus on power dynamics and creative production. She is author of The Writers: A History of American Screenwriters and their Guild (Rutgers University Press, 2015), co-editor of Production Studies: Cultural Studies of Media Industries (Routledge, 2009) and co-editor of Production Studies, The Sequel! Cultural Studies of Global Media Industries (Routledge, 2015). Dr. Banks is a Principal Investigator at the Emerson Engagement Lab. Her work at the Lab has focused on engagement games around collaborative labor and tensions between individual gain and team building. Her current game is Room at the Top, a game that challenges ideas about bias in media production. Previously, she worked on The Boda-Boda Game, a partnership with the Red Cross in Uganda. GAME WORKSHOP - MCMASTER 329 10:00 A.M. TO 12:00 P.M.
Those in attendance will play this massively multiplayer card game designed for in-person engagement that challenges assumptions and biases about creative collaboration. In pursuit of success, how do we weigh our own vision with our team’s strategy? How do we seek out collaborators and what does that tell us about ourselves? Create, negotiate, and compete in a race to achieve success! LECTURE - MCMASTER 214 3:00 P.M. TO 5:00 P.M. Recent years have seen a rise in advocacy initiatives for women and people of color working in Hollywood. Film schools are more equitable than the media industries to which they serve as pipelines, but there are ways in which universities and training programs are reproducing the industries’ biases. In her talk, Miranda Banks will identify challenges and opportunities around issues of equity and access within the industries and pre-industries, arguing that media production programs are uniquely positioned to educate the next generation of media makers about creative collaboration across differences and challenge the status quo. She will discuss two interventions she has been involved in: as designer of Room at the Top, a massively multiplayer game that challenges assumptions about how we collaborate in creative environments, and as a co-founder of the initiative EDIT Media. Devices for Filling a Void combines jewelry with forms of reconstructive surgical devices that are used to hold the flesh in place as it heals. Through the use of the semiotics of gold, this work visualizes the aesthetic, social, and ethical implications of the medicalization of beauty, adornment, and sexuality. The Survey will be conducted at Sustainable Carolina Farm and Gardens behind Green Quad. PlantBot 2.0 is a collaborative effort of two artists and educators, Wendy DesChene and Jeff Schmuki, who satirically look at the possible evolution of plant species through modern agricultural practices and share current scientific knowledge on the environmental and social costs of bioengineered crops. Genetically modified plants are grafted onto robotic and remote-controlled bases to become an organism with no clear heritage and no clear future. Through these humorous street interventions with robot plant hybrids, the artists aim to begin conversations about food issues. PlantBots are a hybrid of imagination, possibility and reality, encouraging communities to see their environments in a new way and begging the question, what will it all become? PlantBot Genetics was awarded NEA and Pulitzer Foundation Grants for exhibitions and/or programming at the Carnegie Museum of Art in Pittsburgh, the Goethe Institute in Egypt, the Bach Modern in Austria, the New Gallery of Canada, and the Marfa Dialogues occurring in St. Louis. Originally hailing from Canada, Wendy DesChene earned an MFA from the Tyler School of Art. She teaches at Auburn University in Alabama. Jeff Schmuki was raised in Arizona and earned his MFA from New York State College of Ceramics at Alfred University. He teaches at Georgia Southern University.